Just like the Osprey, the African Fish Eagle has barbs on its feet to help it hold on to slippery fish, its main prey. The African Fish Eagle’s loud distinctive call is an iconic sound of Africa. 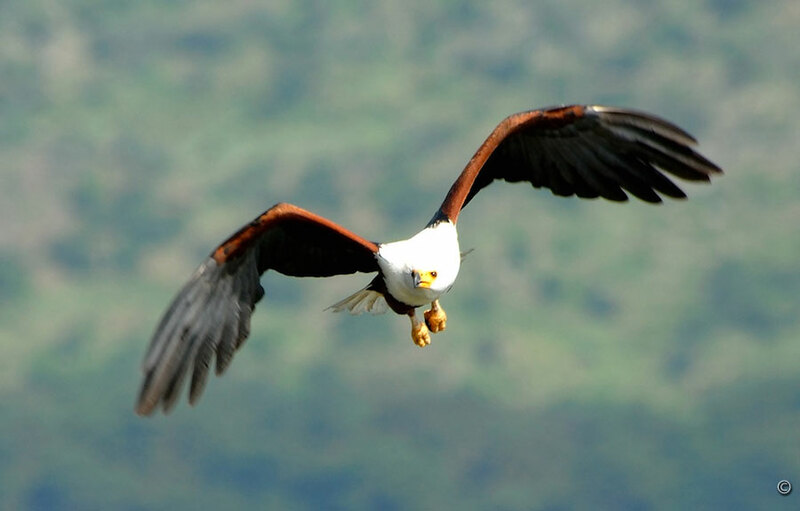 The African Fish Eagle has the honor of being the national bird of three nations: Zambia, Zimbabwe and South Sudan. 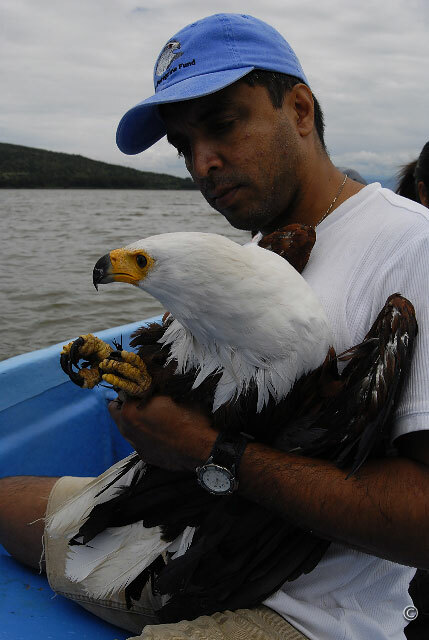 The Peregrine Fund has been monitoring populations of African Fish Eagles at Lake Naivasha in Kenya since 1994. Scientists have found that the number of eagles present is closely tied to the lake's water level and annual commercial fish catches. 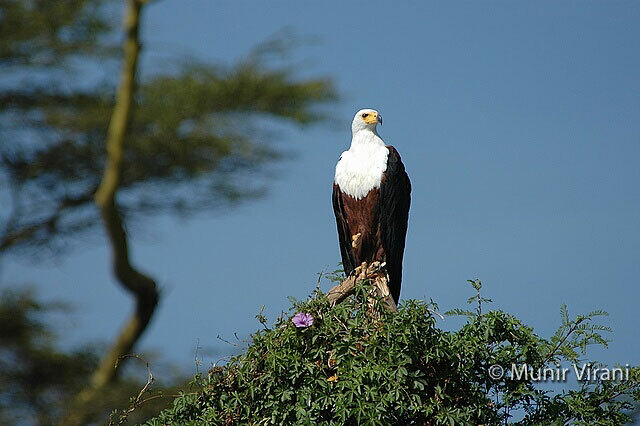 For example, populations of fish eagles at Naivasha have remained fairly constant, but a severe drought in 2009 made it hard for the eagles to successfully breed. Breeding pairs dropped off, but as soon as water levels rose again, so did the numbers of breeding pairs. 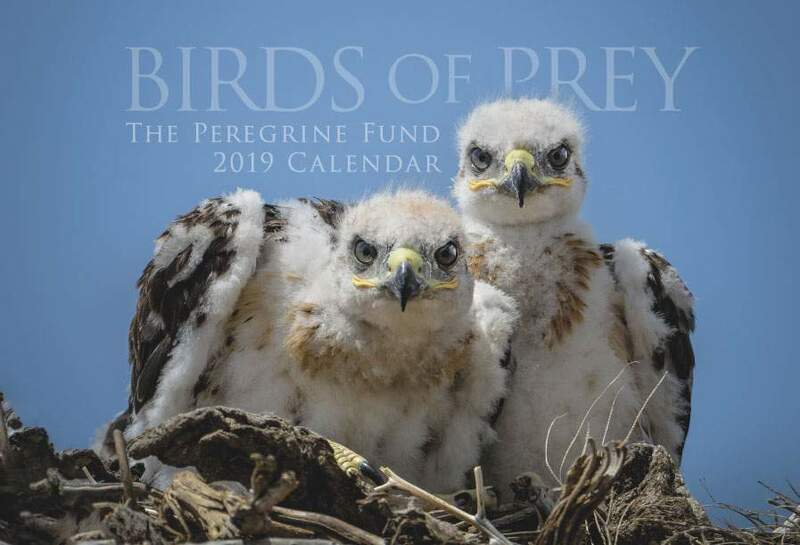 More recently, Peregrine Fund biologists have expanded their work to include another area known as Lake Baringo, about 60 miles north of Naivasha. Here, populations of African Fish Eagles have dropped significantly and breeding rates have been low. Our biologists are studying these two populations of African Fish Eagles to better understand what factors affect breeding success and to learn how to work with local communities and governments to help preserve this very special bird of prey. True to the first part of its name, the African Fish Eagle is distributed far and wide throughout Africa, the world’s second largest continent. 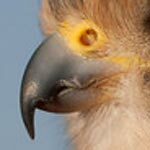 This eagle is relatively common and widespread in a variety of habitats south of the Sahara Desert. And true to the second part of its name, the African Fish Eagle is very fond of eating fish. As you would expect, the African Fish Eagle is generally found living next to bodies of water of almost any type and size. This beautiful bird of prey can be seen perched on trees or other prominent sites near ponds, estuaries, lakes, rivers, streams, coastal waters, and wetlands. 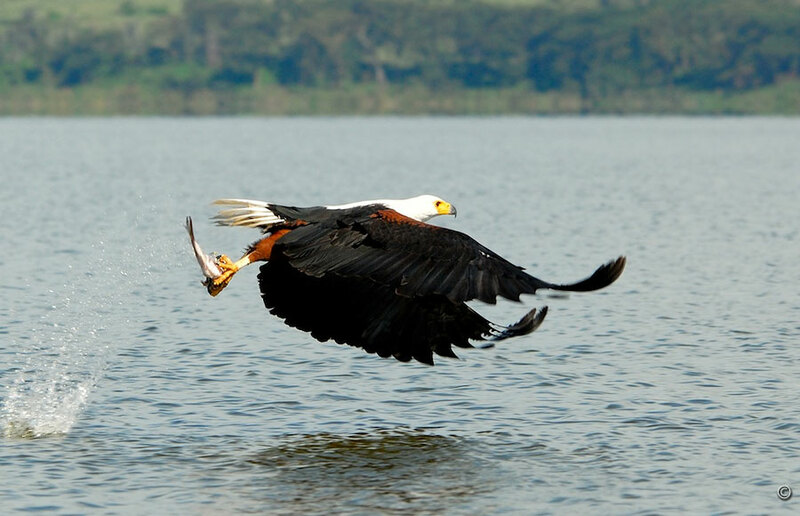 The stunning African Fish Eagle, with its milk-white head and tail, dark eyes, yellow cere, and chocolate brown back, has become synonymous with Africa’s inland waters, lakes, rivers and dams. In fact, its loud, piercing calls are a characteristic sound around African waterways. If you hear the call of the African Fish Eagle, you are likely to be in a relatively healthy environment. Like many birds of prey, the African Fish Eagle is an indicator species. How is this so? These eagles need lots of fish to eat and tall trees to perch and nest in. If a waterway is contaminated, the fish and other water animals will die and the eagles will have nothing to eat, so they won’t survive long. If the area has been deforested, the birds will have nowhere to nest or perch and will leave in search of a better place to live. If these eagles are around, they are finding everything they need to survive in that area. If these eagles are missing or disappearing from an environment where they should be found, biologists know that something is wrong and can begin to research the problem. Though the African Fish Eagle is still common throughout its range, its food supply is being negatively affected by overfishing. Pollution and contamination from nearby factories and even flower farms also can poison fish and other lake-dwelling creatures, leaving the African Fish Eagle with little choice for food. As if that weren’t enough to worry about, drought and overuse of the lake’s water affect water levels, which affect the number and types of fish that are able to survive. If the raptor’s food supply gets too low, many individuals will not be able to find enough food to raise young, and others will starve to death. Protecting the continent’s lakes from pollution and overfishing are two important steps to help conserve the African Fish Eagle. Fish, fish, and more fish. 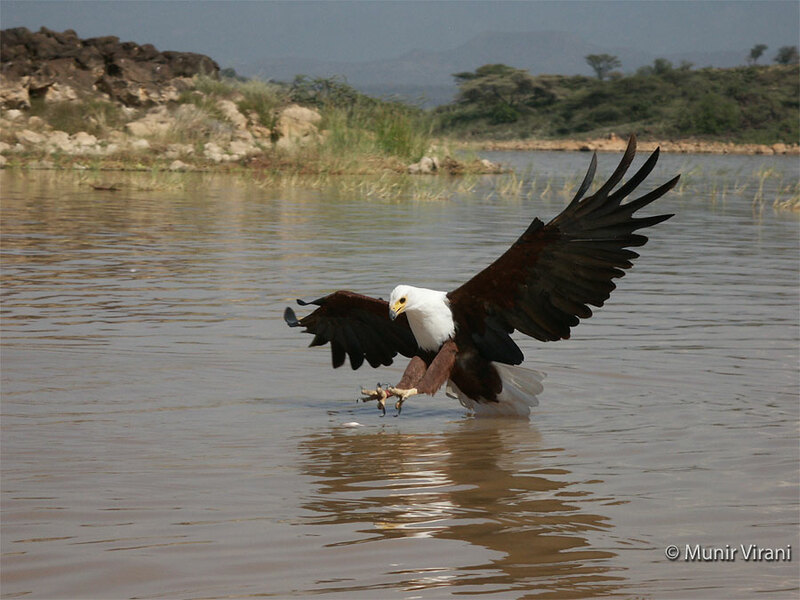 The African Fish Eagle is a true fisherman. Just like the Osprey, African Fish Eagles eat a wide variety of fish. However, unlike the Osprey, they don’t submerge themselves completely under the water when fishing. Instead, they catch their meals from the surface of the water, then fly up to a perch to feed. Like most raptors, the African Fish Eagle is also an opportunist and not one to turn down a chance for a meal. This powerful raptor might attempt to catch things other than fish during dry periods when water levels are low. When the opportunity, or necessity, presents itself, they may prey on small birds and insects, especially termites. They also attack larger birds such as Greater and Lesser Flamingos and even feed on carrion, animals that are already dead. African Fish Eagles are also not above a little stealing when the occasion calls for it. When they see another fish-eating bird, such as the Goliath Heron, with a meal, they will fly over and harass the poor bird until it surrenders its catch. Then the fish eagle swoops in and takes it. There are advantages to being the top predator in the neighborhood! 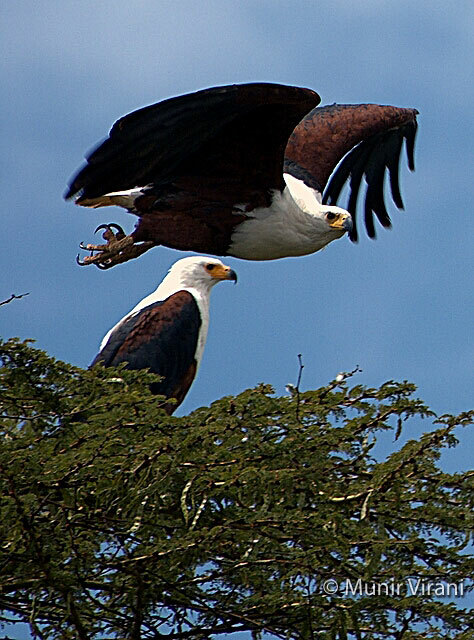 African Fish Eagles build large nests out of sticks and branches, usually in a tree or on a cliff ledge. A pair uses the same nest year after year, each year adding new nesting material to the existing structure. After several years of these “add-ons,” the nests can become quite large. Some nests have measured 6 feet long and 4 feet deep – bigger than a small car! As you can imagine, the nests are usually heavy as well. That is why big, strong trees capable of supporting huge nests are important to breeding pairs of eagles. When it is time, the female lays 1-4 eggs, but usually just two. Incubation is mainly the female's job. For about 45 days, she spends most of her time sitting on her eggs to keep them at a safe temperature. Occasionally, she carefully turns the eggs with her beak to make sure they are warmed evenly. She only leaves the nest to stretch, clean her feathers, and eat. If all is well, the eggs then begin to hatch. 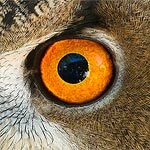 You may be surprised to know that the African Fish Eagle has something in common with the Snowy Owl, a bird that lives all the way on the other side of the world. Just like Snowy Owl eggs, African Fish Eagle eggs don’t all hatch at once. This means that the chicks will be of different ages and different sizes. However, the Snowy Owl usually manages to raise all of its young – no matter what age or size – but the African Fish Eagle young aren’t as lucky. The second chick that hatches, which is smaller than its older sibling, can’t compete for food, and it often dies. Once the chicks hatch, the female continues her role as the primary caregiver to her young. She is responsible for feeding her nestlings, while it is the male’s job to go out and find food for himself and his family. The young remain in the nest for about 70-75 days before they fledge, or fly for the first time. Once the young are flying around, they will remain close to the nest for two or three months before dispersing. In a few years, these young birds will find a territory and a mate and begin raising young on their own. Scientists believe that African Fish Eagles mate for life. The World Center for Birds of Prey offers fun ways to learn about raptors. Interactive activities, tours, interesting videos and a children's room with games, coloring sheets, quizzes and costumes await you. The visitor center has one live sea eagle species on display, a Bald Eagle. This is a great chance to see this eagle up close and learn about the wonderful and interesting adaptations it has in order to survive – some of which are very similar to those of the African Fish Eagle. There is also a touch table with bird feathers and other natural objects available for exploration. Come visit to learn more about all eagles, including the African Fish Eagle.